Got any cool plans for the weekend? Me..Nothing really. Although, I do want to go to the zoo on Monday, just not sure it's going to rain or not. So we will just have to wait it out and see. While the boys were napping this afternoon, I was able to put this card together. 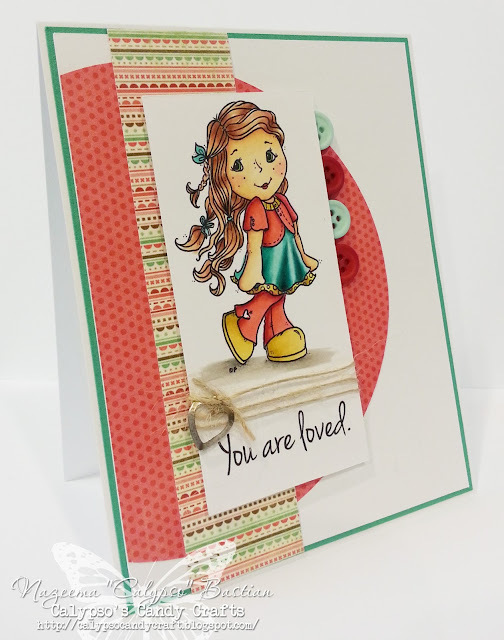 This is "Meet Anneke" from Delightful "Inspirations, previously known as Designed 2 Delight. When I saw this angel, I knew I had to get her. She reminds me of our niece, Carla. I colored her with my Copics and matched her with paper from MME: Life of the Party. Quick post tonight, I have to finish getting set up for movie night and order take out. Just not sure what I feel like eating...Thai...Mexican...or Pizza. I'll have my 3 y/o pick..LOL. Wow! This is amazing! I LOVE the colors you chose, and what you did with the sketch! Beautiful! Calypso, this is so amazing! Love your colouring and yes, she's positively adorable! Love how you used the buttons! Thanks for joining us at Delightfully Inspired from the Heart! Oh Calypso, love your card and your coloring is simply amazing. I have to check out that sketch challenge. Your colouring is amazing - you get such depth of colour. A sweet and beautifully designed card. Thanks for joining us art CRAFT this week. Loving all of the clean lines of your card and the wonderful layout of the sketch. your coloring is fabulous but I must say I adore how you hid part of the buttons under the image layer. Very cool. Thank you so much for sharing your amazing creation for us at 4 Crafty Chicks. Fantastic card! Thank you for joining us for our "Button" challenge over at 4 Crafty Chicks this week! I really love the layout of this card.. And you have colored her beautifully!!! Thank you for joining us over at Sassy Studio Designs DTBST!